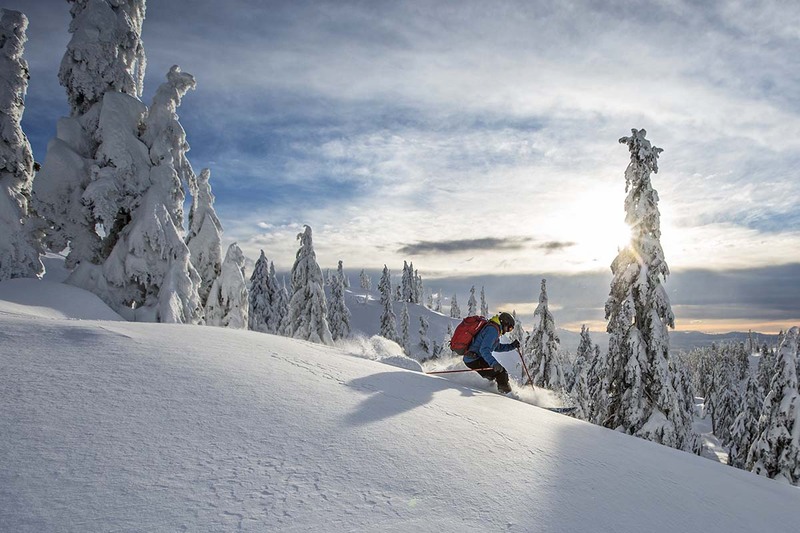 Backcountry skiing can be an incredibly rewarding way to spend your time outdoors—no crowds, untouched snow, and a skin-track workout to compliment your knee-deep powder turns. But the conflicting demands of uphill and downhill travel can make dialing in your clothing choices challenging. It’s important for your overall comfort and well-being to stay cool and ventilated while skinning, but insulated and dry while transitioning and bombing downhill. Layers are the answer, and below we outline our tried-and-true system for backcountry skiing, starting with next-to-skin baselayers, and moving outward to midlayers, shells, gloves, and beyond. For more recommendations to get the most out of your season, see our collection of ski gear reviews. The baselayer is a wear-all-day piece of clothing that keeps body heat in while wicking away sweat and other moisture. Since baselayers—both top and bottom—are in direct contact with our skin, we prefer merino wool over synthetic fabrics for its soft feel and heat-trapping properties, but you pay a little extra for that added comfort. Merino regulates temperature better, too—the same shirt that keeps you warm in the winter will keep you cool when you’re sweating up the skin track in the shoulder season. 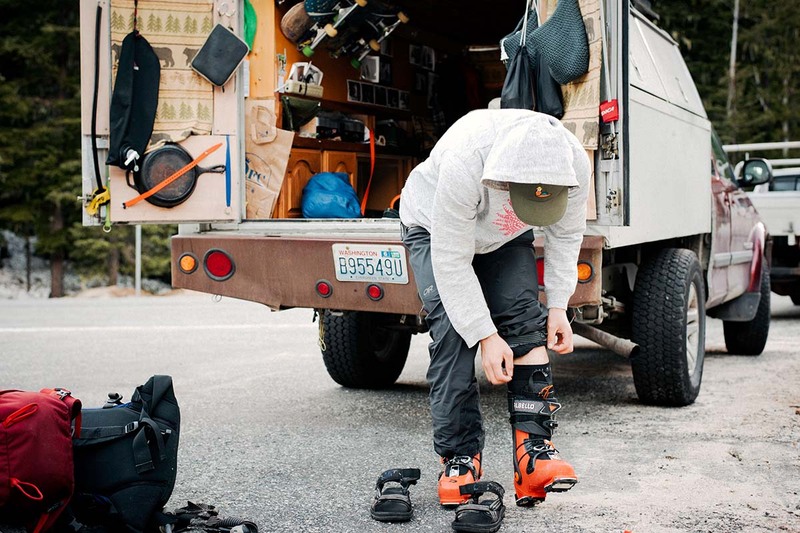 That said, we like to have a few different options in our closets: On the coldest days, a pair of mid- or heavy-weight baselayers provide all-day warmth; when expecting balmy spring skiing conditions, we opt for the most lightweight set. Our favorite overall pick is the Smartwool Merino 250 ¼-Zip for its impressive combination of comfort, warmth, wicking ability, and odor-fighting properties. Moving outward from the baselayer, the next piece of clothing is a midlayer. The midlayer is the most versatile piece of clothing, tasked with both insulation and ventilation. While these are inherently very conflicting demands, many outdoor companies have refined their technology to keep us warm when we’re inactive and cool when we’re working up a sweat. Our go-to midlayer is the Patagonia Nano-Air Hoody: a super soft, stretchy, and breathable synthetic jacket that feels like a combination of a performance down jacket (minus the down) and your favorite hoody. Lightweight down options like the Patagonia Down Sweater will also do the trick, but we prefer the added breathability and water resistance of synthetic insulation. When you take a break from climbing to eat a snack or transition into ski mode, the heat you’ve been building while touring can dissipate in a matter of minutes. In many cases, your midlayer will do the trick to keep you comfortable, but on the coldest days, it's best to bring along a puffy parka. We prefer down over synthetic fill for these jackets due to their extra loft and ability to compress into a tiny package at the bottom of the pack. 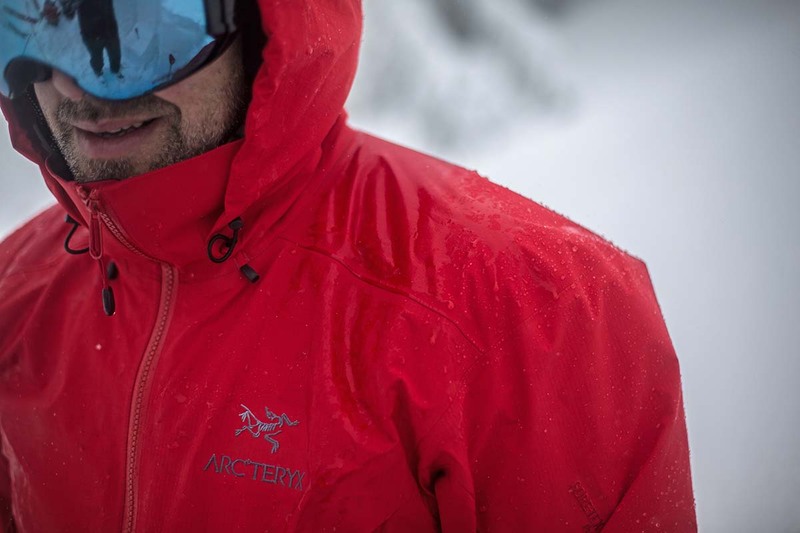 In our article on winter jackets, we include many performance options that will keep you warm during big mountain adventures: Arc’teryx’s Firebee AR is an excellent performance pick (see our in-depth review), but it will be overkill for many (especially in terms of price). Rab's Neutrino Pro offers premium down and a nice feature set at a lower cost. In lieu of a standard resort skiing jacket, backcountry skiers will opt for a hardshell or softshell. Why? A resort ski jacket is often thick and insulated for warmth while riding the chairlift, and heavy and bulky as a result. On the other hand, for top performance in the backcountry you’ll want a lightweight shell with no added insulation. When worn over a base or midlayer, the shell’s main task is weather protection from precipitation and wind—and it should be light enough to pack away for a warm climb. Conditions and personal preference will dictate your choice of hardshell or softshell: A hardshell—like our favorite Arc’teryx Beta AR—has unparalleled waterproofing capabilities and offers superior wind resistance, while a softshell offers less weatherproofing but more breathability and freedom of movement. We prefer a softshell in good conditions or on the skin track at lower elevations, but if weather really moves in, there’s no replacement for a quality hardshell. Similar to a ski jacket, we prefer to wear a pair of non-insulated, weather-resistant or weatherproof pants while backcountry skiing. For folks who tend to heat up quickly when exerting, breathable softshell pants might be the way to go; if you opt for more waterproof hardshell pants, it’s helpful to have side zips to dump heat on the go. Hardshell/softshell hybrids like the Patagonia Descensionist combine the benefits of both designs and are our recommended choice for backcountry ski pants. And if you’re worried about moisture creeping its way in at the waist, it’s worth considering a model with a bib, and you can always throw a heavy baselayer underneath for added warmth on a particularly frigid day. Ski socks have a higher price tag than a pair of everyday or hiking socks, but they’re worth every penny. They typically come just below the knee for full coverage underneath boots, and often offer additional padding in rubbing- and pressure-prone areas. 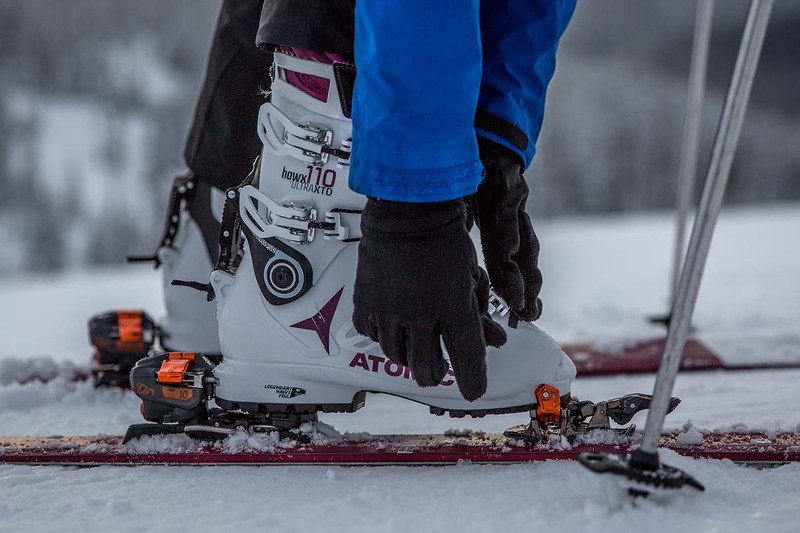 When choosing between heavy or lightweight socks, consider how much space you have inside your ski boots. If they’re already snug, it’s best to stick with a thinner pair, no matter how cold it is outside (a fit that is too tight will compromise circulation and the ability to keep your feet warm). We prefer ultra-soft merino wool or wool blend socks—like the Darn Tough Over-the-Calf Padded Light—for their impressive comfort and softness. And a pro tip: Wear a different pair of socks for the drive to the trailhead, and only change into your ski socks immediately before putting on your boots. This will preserve your ski socks for ultimate dryness and warmth. We love to have a quiver of gloves for backcountry skiing, including a waterproof, insulated shell and a lightweight liner (see below). Your resort glove might double as your backcountry glove, but keep in mind that it should be waterproof as you won’t have the luxury of stepping inside the lodge to regain feeling in your fingers. For the coldest and snowiest of days, we prefer an ultra-protective glove with a gauntlet. When choosing between gloves and mittens, know that gloves make it easier to perform fine motor tasks, like tightening buckles, gripping ski poles, zipping zippers, etc., but if you’re prone to cold hands, mittens can be helpful (your fingers warm each other). And if you choose a leather pair like our top overall pick, the Hestra Heli Glove, remember that you will occasionally need to reapply a leather conditioner (like Nikwax) to maintain the waterproofing. We always keep a pair of thin liner gloves in our pockets or underneath our ski gloves for tasks that require dexterity. There is often tinkering that needs to be done when transitioning from walk mode to ski mode and back—small adjustments on boot buckles, stripping skins, undoing zippers, etc.—that can be challenging with a burly pair of gloves or mittens. While it’d be easiest to just go bare-handed, touching cold metal equipment is far from comfortable. We’re not super picky about which liner we use, and keep it simple and affordable with lightweight options like the Black Diamond LightWeight ScreenTap Fleece Gloves. It can be a challenge to keep your head and ears warm all day in the mountains, and our favorite method is to bring along two beanies. We wear a lightweight hat or headband for uphill travel, and swap it out for a warmer, non-sweaty beanie for the descent (assuming we’re not wearing a helmet). Similar to baselayers, our favorite headwear is made from merino wool or a merino wool blend (for less of an itchy feel). We particularly love the ventilation provided from a headband for the ascent, but wear a beanie for full warmth and coverage on the decent. And on sunny spring days, a baseball cap will provide needed protection from the bright rays. Though not a typical layer, we’d be remiss not to mention helmets here (after all, they do provide a great deal of warmth in addition to safety!). 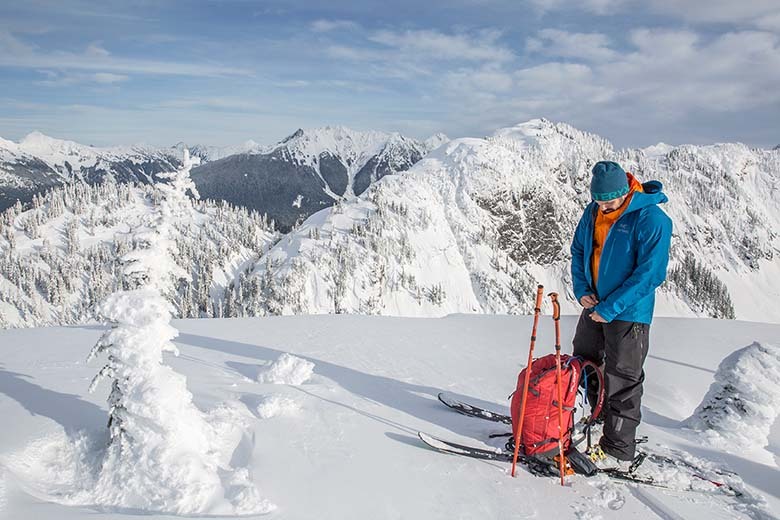 While some backcountry skiers choose to forego helmets since they’re not skiing as fast or as aggressively as they would at a resort, bringing one along is well worth the weight if you ski steeper lines, enter trees, or approach rocky areas. Further, many models are now a fraction of the weight they used to be with the same quality protection. Our favorite backcountry options are lightweight and streamlined enough to stuff in or on our backpack during the ascent (and occasionally put them on in areas prone to rockfall). The Salomon MTN Lab Helmet is our top pick for the backcountry, boasting an extremely low weight and offering cross-functionality as a climbing helmet for ski mountaineering objectives. Everyone is different when it comes to cold-weather layering and preferences. While some shed layers as soon as they start moving, others require hours of constant activity to maintain warmth. We encourage you to use this list as a starting point and to develop your own system based on your specific needs. Maybe you prefer to wear softshell pants with no baselayer underneath, or run so cold you need long underwear plus an insulated ski pant. Maybe you need two midlayers, or none at all. 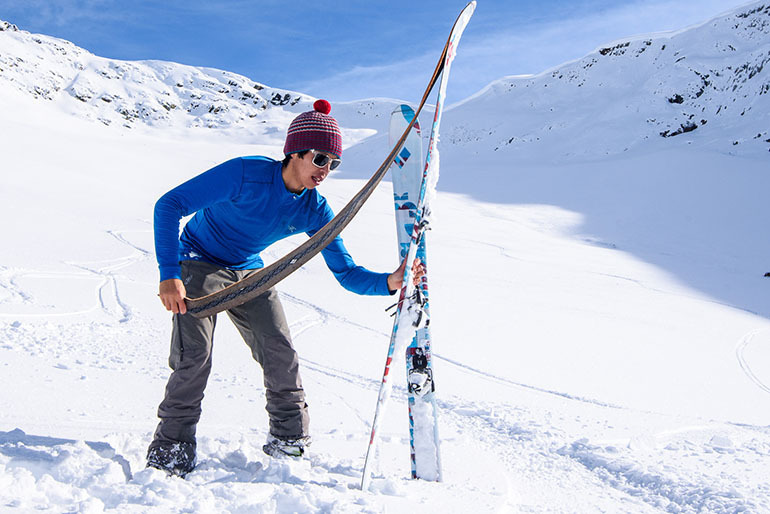 It may take several ski tours to nail the perfect arrangement, but soon you’ll discover what works well for you and what you can safely and comfortably leave behind.